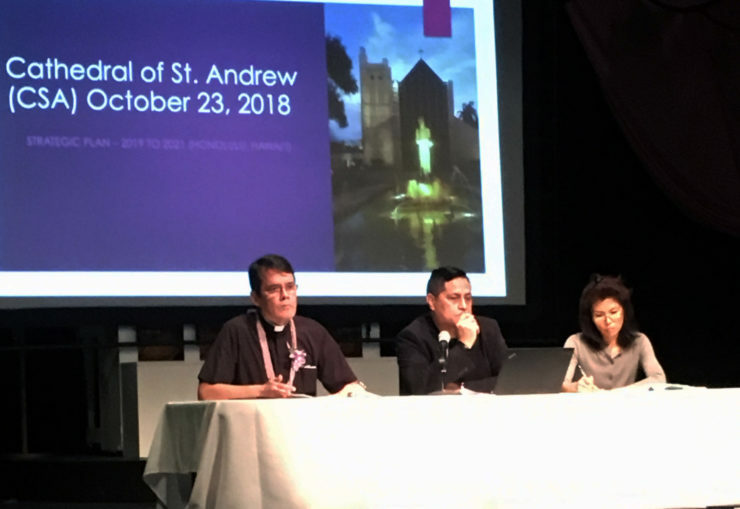 The Cathedral’s 2019 Annual meeting was held on January 27, 2019, in Tenney Theater. Following is a summary of the meeting, with links to appropriate documents for your reference. The slate of candidates proposed by Chapter was unanimously elected. Their bios may be found here. 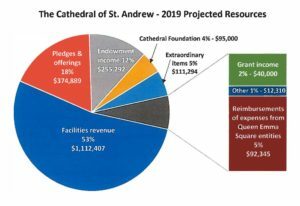 Treasurer Dixie Kaetsu presented the 2019 budget approved by Chapter in December, 2018. 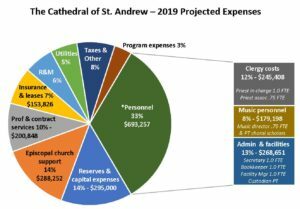 It is a balanced budget, with approximately $2M in income and expenses. A budget narrative may be downloaded here. Actual budgetary figures are provided here. Senior Warden Roth Puahala presented a slide show giving details of the three-year rolling strategic plan developed by your 2018 Chapter. It will serve as a path for 2019 and future Chapters, which are expected to update it each year. The slide show may be viewed here, and the text of the plan may be found here. Fr. Moki gave a report in the form of a video, which may be viewed here. It is approximately 18 minutes long. 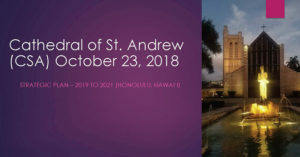 We are grateful to our Wardens, all Chapter Members, Convention Delegates, and all who are willing to serve in various other capacities, and especially to the office staff for helping produce the Annual Report and for enabling the mission of this Cathedral to move forward.